This is part 3 of a tutorial for parsley, the classic fish sauce recipe. You will need 1/2 pint (300 ml) of cold fresh milk. This is what you're now going to blend into your cooked roue. Once again, I favour silicone utensils for this. 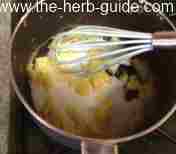 A whisk is brilliant as it helps you keep the parsley fish sauce really smooth. Add about a quarter of the milk. Stir and whisk to get the paste smooth. It's vital to incorporate all of the milk before adding more. Here you can see how smooth the paste is. Don't be impatient, the whole process takes 10 to 15 minutes, but the results are far better than a packet parsley sauce mix! Add another quarter of the milk. As you get better at making this, you will be able to add it in two or three lots - for this tutorial, I recommend you do it in fours. Once again, here's a photo of the blended paste. It's smooth and glossy - just the way it should be. If you've got lumps, then use the back of your spoon to squash them down - it's not the end of the world!